There's this rule that drives fail and stuff must be backed up. Also if you mess up the OS by installing something stupid, you can recover the whole OS to a state that was for example 1 hour ago. A week ago I had to test this option, because by accident I destroyed some virtual network interfaces and was too lazy to try to fix them manually. This requires an installation cd and then the whole hdd is restored. 120 gb in 50 minutes. I thought it could figure out what to reverse and do it faster without an installation cd, but I guess this is how stuff works. It worked perfectly however. I have a Time Machine router from Apple. It's a router with a hdd inside it. Backup/restore happens via wi-fi. It works perfectly. Note: when restoring the whole hdd to an old state, you should link the laptop and the router with a cable. This cuts the restore time in half (10 mb/s on wi-fi, 20 mb/s with cable). Drawbacks: when a drive fails, I need an installation cd, new hdd, screwdrivers to change the drive and a lot of time for the restore operation (1 hour in my case). This solution is not mobile. The router is big, so I can't take it with me on the road. Why would I want to have a mobile backup solution? Well, I have an SSD drive. They tend to fail quite often and without warning. What would happen if I have work abroad and need a laptop and drive that sould not fail, or at least have a backup option? Should I bring a spare hdd, screwdriver, installation cd and the bulky router? 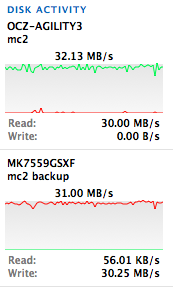 I have a 120gb SSD with a 750 gb HDD for a mobile backup. The backup is 120gb, 200gb if I want some history of the most changed files (yes, the software can even do versioning and incremental backup). What should I do with the rest? Split the drive and have some extra space. Now I have a mobile backup with enough space to bring a ton of music or TED hd lectures. The two softwares I know that can do that are Carbon Copy Cloner (ccc) and SuperDuper! (yes, the exclamation mark is part of the name). CCC is free, that's what I use. Easy to setup. I did all in an hour. 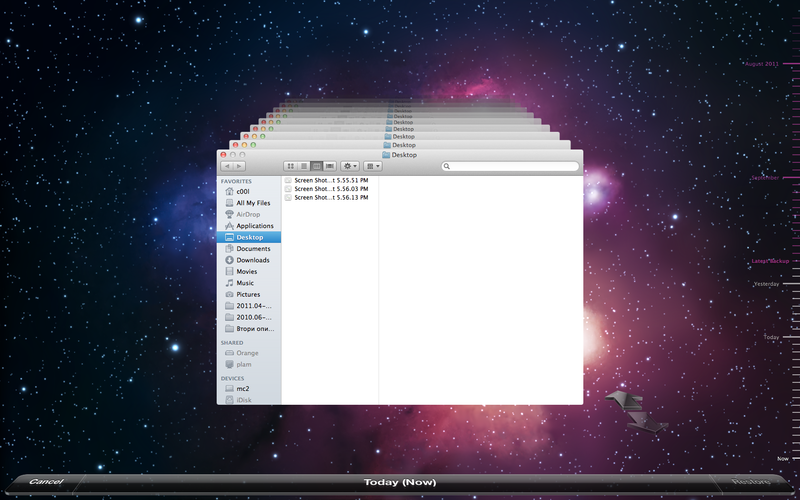 I even rebooted to see whether the backup drive would work. It worked like a charm. It copies with around ~30mb/s. I have not tested SuperDuper!, but it has great reviews, especially the support, they say, is awesome.